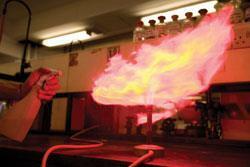 Chemists, like moths, are drawn to a flame. Whether transforming dull rock into gleaming metal, converting sand into glass, or separating mixtures into intoxicating vapours, a hot flame has always played a starring role in the laboratory. 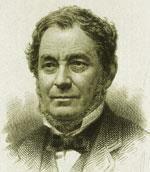 Robert Bunsen: German chemist, 1811-1899. With Gustav Kirchoff developed analytical spectroscopy in 1859, discovered caesium (1860) and rubidium (1861). Wide-ranging experimenter and pioneer of photochemistry. As coal gas became available and began to be used for illumination (Chemistry World, November 2006, p50), many chemists used it to heat their reactions. Griffin describes a set-up involving a gas pipe plumbed underneath a ’long wooden plank’ with openings every 18 inches or so which would allow a large number of students to carry out experiments simultaneously under the watchful eye of a teacher manning the stopcock to ensure the safety of all concerned. ’But’, Griffin concluded, ’it is not possible, by any form of burner yet introduced, to effect with gas, those fusions and decompositions for which the large spirit lamp is recommended.’ Yet Humphry Davy and his assistant Michael Faraday had just mapped out the combustion of hydrocarbons, showing that flame temperature was not an intrinsic property of a gas, but depended on its rate of combustion. Their experiments culminated in Davy’s brilliant solution to the problem of coal damp explosions in coalmines: a flame shrouded by a metal gauze preventing it igniting any gas in the environment; while the flame itself changed appearance in response to gas concentration, alerting the miner to looming danger. 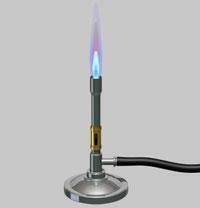 A number of chemists developed variants on the Davy lamp in which a metal gauze produced turbulent mixing of gas and air, raising the temperature of an enclosed flame but preventing disastrous flashback. But in 1828 Faraday described a crucial advance in design. It consisted of a metal tube equipped with a movable conical chimney-pot at the top; the higher the cone, the better the mixing of gas and air, and the hotter and less luminous the flame. The idea didn’t catch on. Twenty five years later, Robert Bunsen, newly appointed professor at Heidelberg, and armed with funds to set up a brand new laboratory, asked his university’s instrument maker, Peter Desaga, to build him a burner. In a very simple design, related to Faraday’s and similar to a device patented in 1856 by the gas engineer R W Elsner, gas flowing from a small jet at the base of a chimney drew air in through a set of holes surrounding it. The result was an adjustable, very hot, and, above all, non-luminous flame. The burner was an instant success. Bunsen had spent several years working on arsenic and its famously smelly and poisonous compound cacodyl (As2Me4). He now turned his attention to electrolysis, developing an efficient electrochemical cell with which he could isolate the most reactive metals including rubidium and caesium. When they were fed to Desaga’s flame, it burst into life with spectacular colours. The modern flame test was born. The physicist Gustav Kirchoff, Bunsen’s friend and colleague, realised that the coloured light could be analysed using a prism. Together Kirchoff and Bunsen laid the foundations of spectroscopy: describing both emission and absorption, paving the way for the quantum theory, and changing the world forever. Today the Bunsen burner is not so universal in our labs - organic solvents and open flames are not the best partners - but it remains one of the most convenient and beautiful of heat sources. To celebrate the memory of its inventors, get yourself a plant sprayer and fill it with a solution of a metal chloride or sulfate in methanol. Fire up your burner, dim the lights, and spray your solution across the flame. As the room turns a lurid hue solemnly intone the mantra: ’Faraday-Elsner-Desaga-Bunsen’. Andrea Sella is an inorganic chemist at University College London. M Kohn, J. Chem. Educ., 1950, 27, 514.